Kids have it pretty rough in horror movies. Really they do. Either they’re the victims, being terrorized and traumatized by brutal, sadistic adults and chased by big scary monsters or they’re the ones doing the terrorizing. And they get away with it most of the time because they’ve got those widdle cutie cheeks and sweet smiles. Who could imagine that behind those big wide innocent eyes such monstrous evil could exist? The child who is the main character of THE OTHER has it doubly rough because he’s both victim and monster. In the Depression era South the Perry farm should be a place of joy and cheer but instead its idyllic happiness is overshadowed by recent events. Alexandra Perry (Diana Muldaur) has secluded herself in her bedroom, totally incapacitated by grief over the recent accidental death of her husband. But everybody is looking forward to the birth of Torrie Rider’s (Jenny Sullivan) child including her younger brother Niles (Chris Udvarnoky) and his twin brother Holland (Martin Udvarnoky). The twin boys spend the long hot summer days playing in the barn, fishing and playing with their beloved Grandma Ada (Uta Hagen) who has taught Niles how to project his consciousness outside of his body and into other minds. Niles is curious as to why Grandma Ada won’t teach Holland how to play “the game”. It’s a question that Grandma Ada is significantly unwilling to answer since she changes the conversation every time the subject of Holland comes up. It’s probably a good idea that Grandma Ada didn’t teach Holland “the game” as Holland appears to be a nasty little boy all on his own. There’s a hideous accident in the barn involving a pitchfork and Cousin Russell. The nearby neighbor lady has a heart attack under mysterious circumstances and Holland’s harmonica is found in her house in a place where it has no business being. Niles carries around several objects in a Prince Albert tobacco can. One of them is the Perry family ring which was supposed to be buried with Mr. Perry. The other object tells plainly how Holland got the ring. The realization of what Holland did drives Alexandra over the edge. But things get worse still when Torrie’s baby is kidnapped one night and the adults hysterically blame not only the kidnapping but all the other misfortunes plaguing the family on the handyman Mr. Angelini (Victor French) Grandma Ada and Niles are the only ones who seem to know the truth. Niles is unwilling to accept it and Grandma Ada realizes that despite her overwhelming love for Niles there’s only one way to deal with what Holland has become. THE OTHER is going to seem slow moving and plodding to most. And most are going to think they’ve figured out the secret between Niles and Holland early on but then there’s a twist at the end that may give you cause to rethink what you’ve seen yet again. And that’s what I like about THE OTHER. It’s easy to just assume this is another good twin/bad twin story but there’s considerable evidence for two or even three other explanations for what happens in this movie and it’s up to the viewer to make up their own mind as to what was real and what wasn’t. I suppose the best way to describe THE OTHER is “Southern gothic psychological horror” and if you’ve a movie-goer who has been brought up on CGI, shocks and gore every thirty seconds then this one will probably put you to sleep. 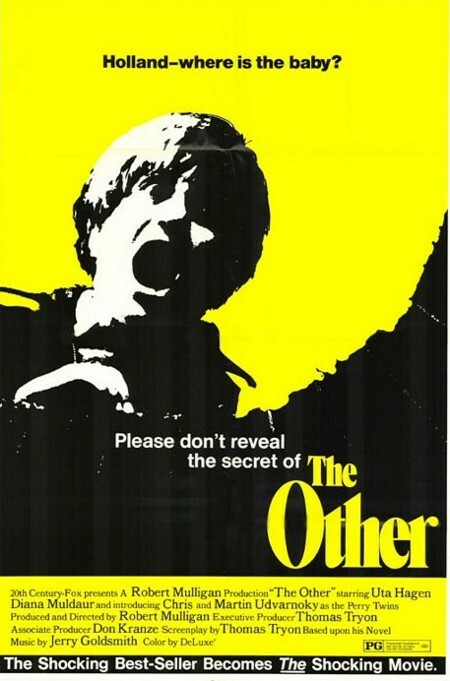 The horror in THE OTHER happens mostly right in the bright, broad summer sunshine except for the totally frightening night when the baby is kidnapped. It’s a movie that takes it’s time telling its story. It won’t be rushed because it knows where it’s going and it knows where it has to take you in order to make the payoff work. The major acting roles here are handled by Uta Hagen who is widely acclaimed as an acting teacher and is mostly known for stage work. She’s really good in her scenes with Chris Udvarnoky. He and his real life twin brother Martin do a wonderful job of conveying both innocent and menace, sometimes both in the same scene. Look for John Ritter is a small supporting role as Torrie’s husband. So should you see THE OTHER? It’s not a movie that you’ll find on a lot of lists as recommended for viewing but I think it’s worth one viewing at least. If you’re in the mood for a horror film that’s zero on special effects but 100 on psychological barbed wire wrapping around your brain try it out. And if you need any added poking to give THE OTHER a try then how’s this: the director of this one also directed the classic “To Kill A Mockingbird” so if you liked that one (and is there anybody alive who doesn’t like “To Kill A Mockingbird”?) then by all means you oughta give this one a look. And how about this: Tom Tryon, who wrote The Other, also played Captain Marvel in the 1940’s movie serial, the greatest superhero serial ever made?